Here we come with another giveaway for you sponsored by The travlite urban shoulder bag. The good news is that will be 3 winners who will have the chance to win a travlite urban shoulder bag. The giveaway is open only for people from Europe. Most of us travel with our smart phones and tablets; and sometime we need to carry an umbrella. The travlite urban shoulder bag is perfect for your daily use. 230D NYLON double stitched, water resistant to protect item in the main compartment. Two accessible pockets for mobile phones, Blackberry handsets, iPhones and iPods. Secured inside zip up pocket for cash, ID cards and credit cards. Easy access pocket for your travel and metro pass. 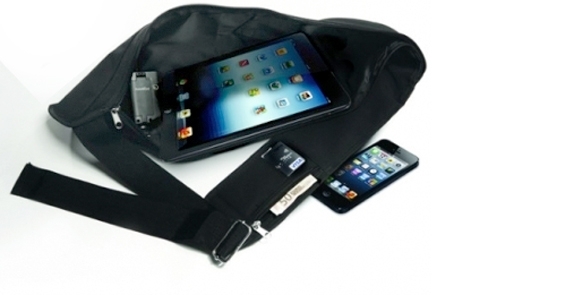 Large external expandable pocket for magazines, news papers and it can also accommodate an umbrella. This is the main pocket for your iPad mini, and if you have any of the tablets listed here, then this is the perfect bag for you! There are three additional inside pockets in the main compartment you can safely carry important documents such as passports and driving license. The winners will be chosen randomly and announced by mail. The giveaway will end May 10. Than you for this great giveaway! Is it me the Laura A. entry 57? What do I do now?